CHILD’s wealth of longitudinal environmental, immunological, physiologic and genetic data, allows for both traditional and novel strategies of data analysis to test novel hypotheses related to DOHaD. The Study is actively participating in efforts to create standardized data definitions and transparent data dictionaries, in order to increase the utility and power of its datasets and maximize opportunities for collaboration. How to access CHILD Study data. Detailed environmental and health questionnaires have been completed by CHILD Study subjects at 11 different time points from mid-pregnancy to 5 years. No similar study has analyzed the home environment of such a large pregnancy-based cohort at the same level of detail, with “environment” interpreted broadly to include physical, chemical, viral, bacterial, nutritional and psychosocial exposures. 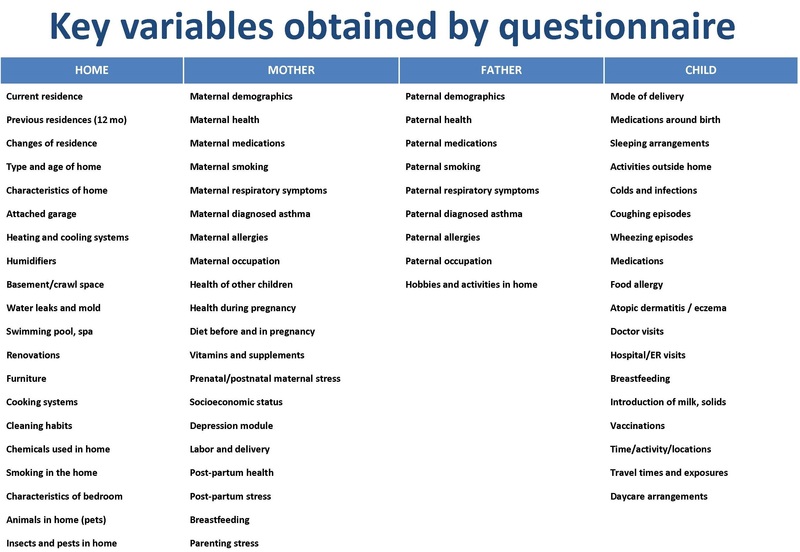 Other data collected by questionnaires include: mode of delivery; duration and exclusivity of breastfeeding; use of daycare; exposures to medications, especially antibiotics; maternal diet during pregnancy; and infant/child diet and growth. Clinical measures taken include general anthropometrics, allergy skin prick tests, blood pressure, waist circumference, skinfold thickness and lung function (spirometry). The data increasingly being generated by analysis of the Study’s biological samples, including through genetic and epigenetic studies, are retained by the Study and integrated into its bioinformatics platform. Parents have provided permission to access appropriate databases for supplemental information. For an overview of environmental factors assessed in the CHILD Study, see Takaro et al (Journal of Exposure Science and Environmental Epidemiology, Mar 2015).